The Dooras (Dubhros) pensinsula juts out in to Lough Corrib, on the north-west side of the lake, and runs from the village of Corr na Móna to the island of Inisdoorus. 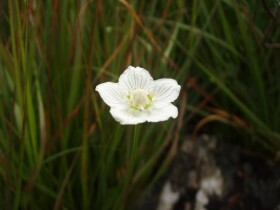 Along its length are to be found a wide variety of wild flowers, many of which can be seen along the roadside, but some are hidden away and access is over wet and boggy ground. View our Photo Gallery of Wildflowers. My interest in wild flowers began in the early 70’s. We would come to Corr na Móna each May for the fishing and, when our children were small and I wasn’t fishing, I used to take them for walks. Seeing the variety of plants along the roadside prompted me to buy my first wildflower book, a pocket sized Collins Gem Guide. This was my trusty reference book for along time before I graduated to more detailed guides as my interest developed. About ten years ago, I decided to try and catalogue the flowers growing locally, purely for my own interest. Over recent years, a number of visitors have stayed at the Cottage who share my interest and it is always a pleasure to swap notes on plant locations and identification. Some members of The Wild Flower Society and the BSBI have visited the area and stayed at the Cottage and, thanks to their willingness to share their knowledge and experience, I have been able to add to my catalogue of flowers. I am happy to give directions on where to find various plants and have a number of wildflower guides/keys which visitors expressing an interest in learning more about the local flora can borrow. 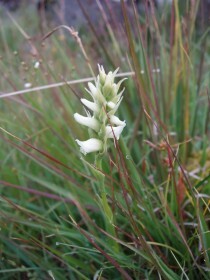 For a perspective on the biology of another Irish lake, including recordings of sightings of Spiranthes romanzoffiana , see the Lough Allen Basin website. As an introduction to the wildflowers of Ireland, I can recommend Zoe Devlin’s new book Wildflowers of Ireland, A Personal Record published by The Collins Press, Cork. Zoe has also produced a Field Guide suitable to taking out with you on a walk. Her latest book, Blooming Marvellous, A Wildflower Hunter’s Year, published in 2017 and also published by The Collins Press.